Bill Bryson Books After having it for over a month I decided to give it a go as I was in dire need of some non-fiction. It's started off well and I've already marked down things for further casual research if he doesn't cover it in the book. 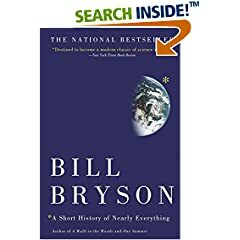 Bill Bryson's a safe bet for entertaining reading. Bill Bryson Books Good but not as good as some of his other books I think. Bill Bryson Books I'm just getting in to this book, written by the author of "A Walk in the Woods". An exploration of the beginning of the cosmos and the origins of life on earth.